Srikanta by Sarat Chandra Chattopadhyay is the first novel by the noted Bengali novelist, that I have read, and is a part of The Saratchandra Omnibus. The story revolves around a wandering young man from the age of fifteen to thirty plus. It is written in first person by a man who has seen the world and wishes to share his experience with the readers. The opening line summarizes the essence of novel, “As I sit down to tell my story in this fading afternoon of my wandering life, I am flooded with memories.” And, so began an unabashed memoir of Srikanta’s life, in the choicest of words, garlanded with lyrical prose, and melodious poetry. In the beginning, Srikanta humbly asks for readers’ sympathy for the unromantic narration, as he is just a simple person, not some famous poet. However, in the first two pages itself, I was won over by the author’s perfect prose, pregnant with humor, satire and beautiful description of nature, belying his claim of being a novice. As I progressed, I noted a brilliant plot doctoring by Sarat Chandra. He has clinically segregated his novel into four parts, resonating each division with different phases in Srikanta’s life. Basically, the novel is a love story of Srikanta and Rajlakshmi aka Pyari, but this commonest theme is treated in the most unique manner, and the result is a voluminous complex novel, which enticed me with its steady flow and innovative story telling. Part I – The River- The novel begins in a town situated on the outskirts of a river, where Srikanta spent his late childhood in his aunt’s house. Here he meets with some characters who shape his outlook toward life. Prominent among them are : Indra, a burly boy, who teaches him a lesson or two about religious and social might; And, Annada di, a sacrificing woman, who leaves an indelible impression on his mind, and henceforth becomes his usual scale to measure the worth of a woman. However, as Shrikanta grows up and joins his King friend at a safari, a chance meeting with Pyari, the dancing girl, who happens to be a child widow of his own village, and supposedly dead, brings about a noticeable change in his attitude. He considers Pyari to be the basest woman, who has left all morals, for the sake of comfort and tries hard to get away from her. He even ends up being an ascetic. But, in his zeal to serve sick people, he himself falls ill and is nursed by Pyari in her own house, thereby bringing the two in unavoidable proximity. Part II – The Exile- Shrikant is nothing if not stubbornly self respecting. Though Pyari aka Rajlakshmi nurses him well, as soon as he recovers, he abandons her and sails to Burma. And, here he meets another strong woman Abhaya, who is traveling with a companion, Rohini, and is supposedly going to Burma to look out for her estranged husband. Srikanta empathizes with this ‘forward woman’ and soon becomes privy and witness to the cruelty of her husband. Abhaya abandons her husband and accepts Rohini as her lover. Though, initially, Srikanta is skeptical of this move, but the common suffering of progressive Burmese women at the hands of menfolk, forces him to accept the folly of his own kind, who take women for granted. Particularly, after seeing the treatment meted to a poor Burmese woman by one of his room mates, his attitude undergoes a sea change and he whole heartedly accepts Abhaya’s point of view. He even approaches her, when he lands himself in plague, by nursing a sick man. Srikanta now realizes the fragility of moral values and religious sanctions, he is somewhat relieved of his rigid sense of right and wrong, and comes back to Pyari, who is by now, living as an austere woman Rajlakshmi, pining for him. Part III – Forbidden Fruit- In this phase of the story, Srikanta and Rajlakshmi get over their initial awkwardness and live as a couple in a small village Gangamati. It is supposedly the happiest time for the two. But, as luck would have it, through the ascetic Ananda and morally upright Sunanda, Rajlakshmi undergoes a transformation, as she becomes concerned about her next life, and moves away from Srikanta. She is jolted into reality, only when Srikanta again falls ill, while nursing a few sick railway men. Part IV – Journey’s end – As the name suggests, this is the final phase of Srikanta’s life. The opening sums it up “All my life I have revolved like a satellite around a luminary I never possessed but could not disown.” As he realizes that he and Rajlakshmi have moved away from each other, he tries going back to Burma, and restart his life. However, as destiny had other plans, he is ensnared by one of his relatives to marry a young relation ‘Putu’. Even Srikanta, for a moment falters, and asks for Laxmi’s permission for wedding, but he is denied the same and he goes back to his native village, with an intention of giving dowry, so that Putu could marry a man of her choice. While returning, he ends up meeting with Gahar, his childhood Muslim friend, who introduces him to Brahmos, in particular, Kamal Lata, a beautiful woman, who can charm any man. But, quite surprisingly Kamal Lata herself falls in love with him at the very first instance, and tells him about her troubled past. As Srikanta gains knowledge of atrocities committed against women in society, he increasingly becomes vocal in their support. His perception of women undergoes a drastic change from the sacrificing, mute puppet Annada, to the self deceiving Pyari, who transforms herself into a housewife for the sake of love. Similarly, as he gains the understanding of woman through the ordeals of Abhaya and Kamal Lata, he comes to admire their strengths in fighting destiny and society. And, by the time, this novel of 419 pages is over, Srikanta is a changed man, and I am a loyal fan of Sharat Chandra! Beautiful lyrical poems in the last chapter floored me. Aruna Chakravarti did a good job in translation, and especially in retaining the Bangla lyrics and odd words, as it gave a very regional flavor to the story. I absolutely loved the way, the story is developed, from a simple account of a child’s adventure in river, where I expected the story to be somewhat similar to Huckleberry Finn, slowly acquiring a darker, sombre hue of the follies committed by a young adult. The well crafted novel gave a glimpse into the Bengal of 19th century, painting a worthy portrayal of customs, traditions and even caste prejudices that were common at those times. The novel does have autobiographical elements, as the narrator talks about an unspecified part of Bihar, where he spent the greater part of his childhood, his stint as a sanyasi and the adventurous journey to Burma, which essentially happened in Sarat’s own life, and in a way, the novel reflects Sarat’s own outlook towards life, which was quite progressive and controversial for his times. He comes across as a champion of women emancipation and is quite vocal about burning social and religious issues. Though, his over indulgence towards other religions being better than Hinduism, just because a handful of individuals were committing error of reason did not sound well to me. But, as soon as I finished the story, I realized that in a way, the four parts of the novel loosely represented the four karmas of Hindu philosophy, namely Dharma, Artha, Kama and Moksha. As in first part, Srikanta is too morally upright and expects women to surrender to the wills of her husband, always eager to straitjacket people in his preconceived notions of religious diktats, thus laying emphasis on Dharma, albeit in the restricted sense of word. However, during his sojourn to Burma, where he essentially looks towards earning a livelihood i.e. Artha, his understanding of women undergoes a sea change, and he heartily accepts Abhaya with her daring attitude and even forgives Pyari for her immoral living. In the third part, the focus is on Kama, with Rajlakshmi and Srikanta pretending to live as a married couple. In the final part, the Moksha part is evident through Kamal Lata, where emphasis is laid on spirituality and salvation. Even, the non believing Srikanta is re-christened as Nutan Gosain. I know, it is strange to find such a profound influence of Hindu philosophy on the works of a writer, who portrayed himself as a rebel. But, probably some impressions are too deep rooted to brush off, and they tend to seep unknowingly. 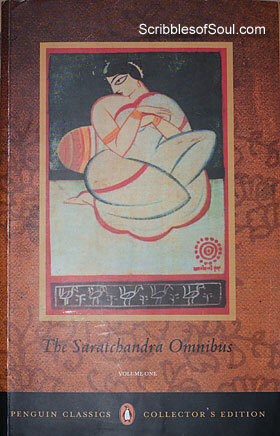 All in all, Srikanta is a wonderful treatise on human emotions and particularly women emancipation. If you want to read just one novel by Sarat Chandra, then let it be Srikanta. I am sure, you won’t be able to stop yourself from reading more! I read this novel not less than 20 times. It is more than a novel and it is a direction towards society. Blind Beauty of Boris, War and Peace of Tolstoy are still less with social concepts. My pranam to Sarath. Scince childhood whenever i saw the novel kept in my fathers self i always wanted to read it but could not as i did’nt knew bengali and it was in bengali though both my parents knew bengali no one would read it to me completely no one have such patience to sit dictating a book to a 5 year old toddler and my father was different! I grew up….in college once i got hold of the book and now i knew to read in bengali somewhat learned from my mother and had also seen srikanta in tv serial but could not understand what is the fact i sat down to read and only able to complete little from 1st part but always had in mind what ia the whole story about now after reading it in summary i could not only understand the story but also a fact of my own life and important lesson of life of one not to get attached with any one thing second looking life in a broader prespective learning every incident and day of life towards perfection and knowledge. Yes Debasis, the novel is indeed about life lessons, handed down to us, fortunate readers, by one of the most talented writers. If you are unable to read it in Bangla, do read the English version. I have read it in English itself and the story and narrative is so versatile that you wouldn’t feel, its a translation and not the original work. Some stories carry themselves regardless of language. And Srikanta is definitely one of those. It is a bit voluminous, but then again even if you read only this one, you can delectably taste Sarat Chandra’s myriad literary skills and genius prose.